‘Pigeon Patrol’ is a typical war era cartoon. It tells about Homer Pigeon, a dopey little country pigeon, whose girl Daisy May is impressed by the USA carrier pigeons, who look like American army planes. Rejected by Daisy May, Homer decides to volunteer, too, but he’s way too small. However when he encounters a crashed carrier, he rescues an important message from an ugly Japanese vulture, beating the enemy saying: “remember Pearl Harbor and Singapore!”. In the end we watch him being decorated and happily married to Daisy May. ‘Pigeon Patrol’ is not too funny, but very propagandistic. It seems to want to emphasize that every man can do his job for the country. The Japanese vulture belongs to the typical stereotyped caricatures of a Japanese in Hollywood cartoons, complete with a suggestion of general Tojo-like glasses. 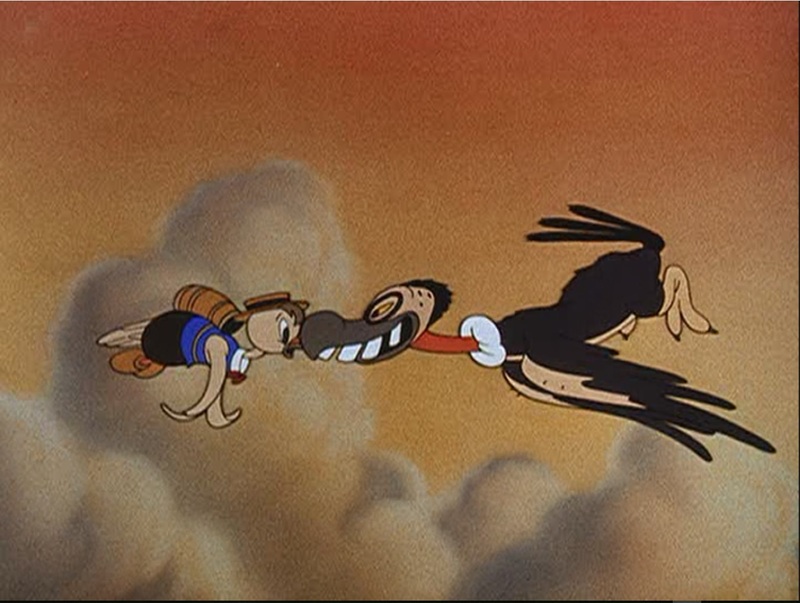 Two years later, Warner Bros. would tell another tale about a pigeon called Homer in ‘Plane Daffy‘ (1944). Their Homer commits suicide in that film. Walter Lantz’s Homer Pigeon, however, would star one other cartoon, ‘Pigeon Holed’ from 1956.